On yesterday’s post, Alan Mann of Left at the Gate left a compelling comment on about NHL players going to the Olympics in Sochi in 2014—I can’t argue with his points. And as I responded then, all the more reason for us to savor the hockey that these Olympics gave us. No matter who you were rooting for, you got inspired, competitive, intense hockey at its best. OK, maybe not if you were rooting for the Finns or the Russians in the quarters and semis. The gold medal game was all anyone could have hoped for—tight, well-played, fast. Both teams made mistakes, and they paid for them, Canada with the gold medal within 30 seconds of its grasp. For Rangers’ fans, the site of a blasted Devil, this time Zach Parise, putting home a soul-crushing, tying goal had to recall the aptly-named Valeri Zelepukin tying the Rangers with 7.7 seconds left in Game 7 of the 1994 Eastern Conference finals. This time, though, most Rangers’ fans exulted in the Devil’s goal. And like that ’94 Rangers’ team, the team that had given up the goal came out of the locker room and reclaimed the lead—but this time, happily for Canadians everywhere, it didn’t take double overtime. Their cardiac—or digestive–systems likely couldn’t have stood it. Wow, Ryan Miller. We knew you were good, but we didn’t know you were that good. You deserved a gold medal, and you deserve a Stanley Cup. My favorite image of the Games, thanks to Greg Wyshynski of Puck Daddy. Via twitpic. The president of Vancouver’s Olympic organizing committee is named…John Furlong. I’ll miss him. The memory of Nodar Kumaritashvili, whose horrible death marked the opening of the games, and who shouldn’t be forgotten in the glow of this closing weekend. I never stopped giggling when I heard hockey people talking about finding someone to play with Crosby and Nash…what, Young or Stills wasn’t available? 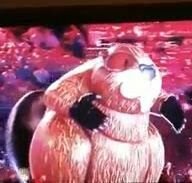 The “Made in Canada” part of the closing ceremonies–while my favorite was the table hockey game brought to life, Bob Costas immortalized another segment with his “always enjoyable giant inflatable beaver” comment. I looked for a photo, I really did–inexplicably couldn’t find one. Update: didn’t take long for them to start appearing this morning. You can even become a fan of the Giant Inflatable Beaver on Facebook. Congratulations to Team Canada and Team USA. You gave us the hockey game we’d hoped for. Drury and Callahan, see you at the Garden. March 1, 2010 in hockey.